Ah! Hawaii! You were so beautiful! God never ceases to amaze me with His beauty! For people who don't know me, I'm a workaholic! But, I actually love it! I can't imagine life without me doing the 50 million things I'm constantly doing. I don't think my planner is ever empty! I rarely have time for days off from work. Sure I plan fun hangouts and coffee dates with my close friends sometimes - it's important to take breaks... But for the most part I've always got something I'm working on. Anyhow, I wanna talk to you guys about one of the greatest experiences I've had on one of my recent trips to Hawaii: The Stairway to Heaven! And because I'm sure you're wondering, no Danny didn't go with me.. lol. I tried convincing him for months and I was really close to getting a yes, but when it came time to go, that "almost yes" turned into the quickest no. 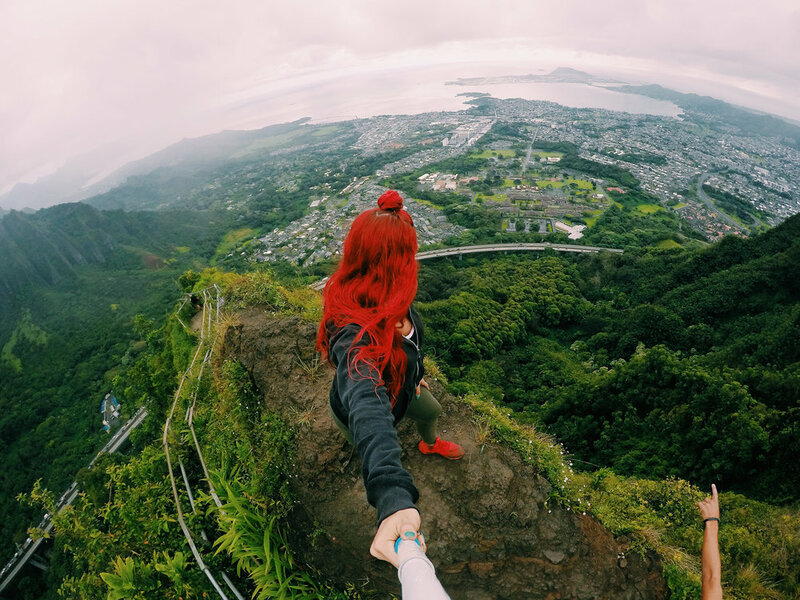 I'm crazy when it comes to adventure. I'm not one who likes to lay out on the beach the entire time I'm on vacation. I love to explore and create new experiences that I could never have while living my everyday life. So as I researched Hawii, I decided I wanted to fly to Oahu. As I was looking through all the hikes, I found this stairway that absolutely blew my mind. I HAD TO do it! Especially after I read they were considering taking it down. 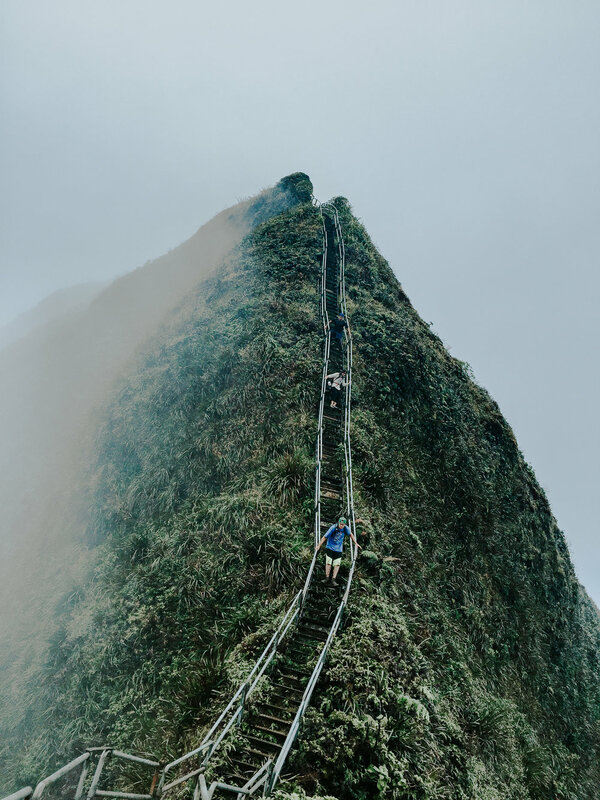 So I researched and researched and finally found out that the Haiku Stairs aka Stairway to Heaven Hike was actually illegal... After going up and down the stairs myself, I could see why! There were a ton of broken steps at really high altitudes, and there were entire segments without railings. This hike is definitely not for the light hearted. It's only for the risk takers. Just to get to the hike, you have to jump fences, take a mini-hike through a private neighborhood and than sneak past a guard! Really early on in the hike, you have to climb a vertical ladder up a very steep mountain face. Shortly after, you’re climbing steps over a highway along the ridgeline of a mountain. I've gotta say, its been one of the best experiences of my life thus far. A few fun facts about these stairs. 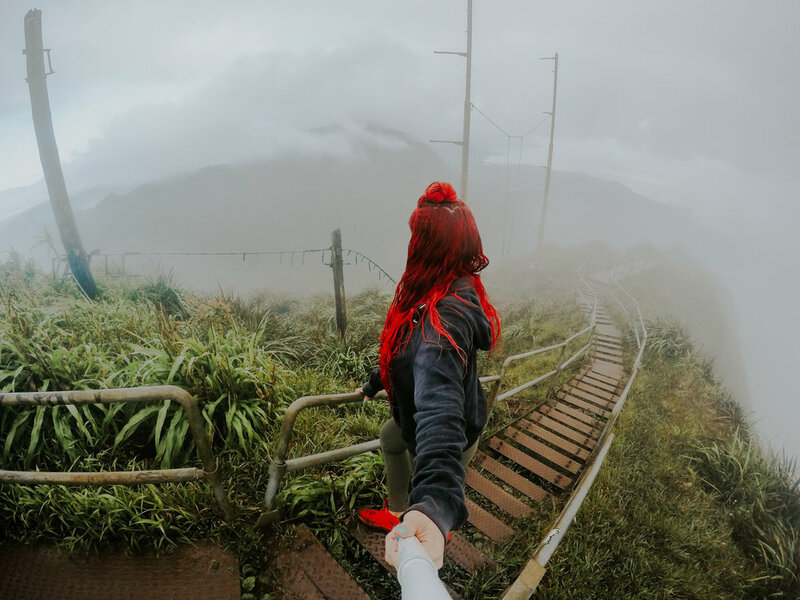 The stairway was originally wooden and was installed during World War II so the military could access a radio station antenna 2,000 feet up the mountain. In the 1950s, the stairs were replaced with steel steps that led to a newly established Coast Guard navigation station. These stairs consist of 3,922 steps. It takes an average of 3-4 hours to get up the stairs and another 3 hours to get back down. Long story short, this was a HUGE risk to take, but to be honest, I'd totally do it again in heart beat!